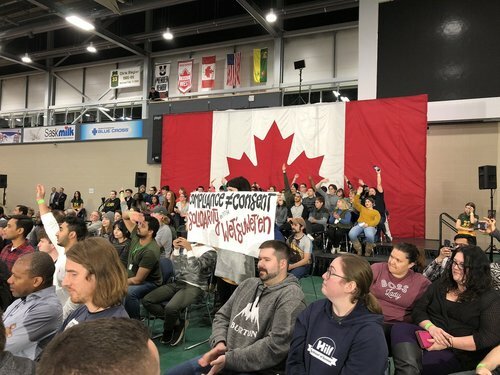 Stephanie Taylor reports from the University of Regina, where Prime Minister Justin Trudeau is holding a town hall meeting. Things kind of go sideways when another woman asks Trudeau about why Canada gets oil from Saudi Arabia, and why Trudeau supports Sharia Law ... she says there are many lies. Trudeau accuses federal Conservatives of not wanting to fight climate change and says Canadians should be ‘thoughtful’ about that in 2019. Now he explains how a carbon tax will work. And now to a question from a child. ‘How did you become PM.’ I’m not going to tweet this ... I assume most adults know this. 18th question is about recently passed accessibility legislation and why ASL and sign language wasn’t recognized. Trudeau says he will follow up with him afterwards. 20th question comes from a international business grad student named Michelle. She appeals to the PM about her case. That was the final question. Town hall wraps up and so does my live tweeting. Thanks for following along.